High pressure remains centred to the north and east of the UK during the coming days. However there will be subtle changes. Warmer air is expected to feed in across the UK as winds turn into a southeasterly direction. Also there is the possibility of rain in the west as Atlantic disturbances approach. 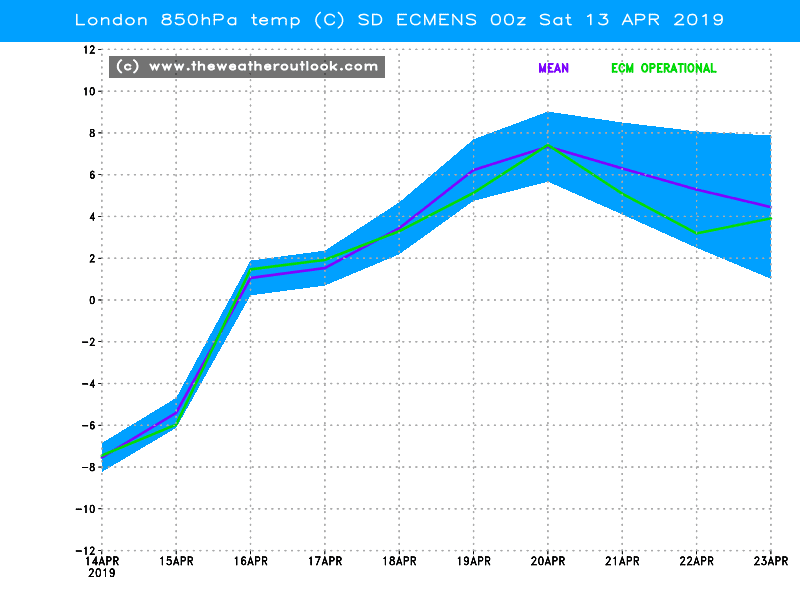 This morning's ECM 00z 850hPa temperature ensemble is consistent with recent updates and other medium range models. The plot below for London shows the air mass at approximately 1500m above our heads warming up progressively next week. Today's 850hPa values are close to -7C but by Saturday 20th April the forecast spread ranges from 4C to 9C with the operational run close to 7C. So an increase of at least 11C is indicated. If the top end values verified temperatures at the ground level could reach 20C to 22C. As I suggested above there is a chance of the Easter period being quite warm. 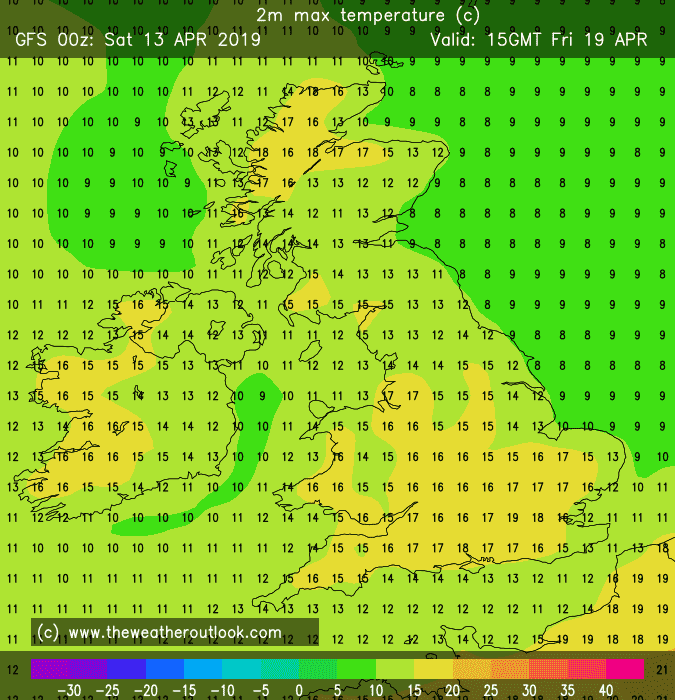 The plot below from today's GFS 00z showing maximum forecast temperature for Good Friday. It gives an indication of the possibilities and is consistent with the ECM data I discussed. The GFS 00z 2m temperature anomaly chart below shows an approximation of how forecast temperatures compare to the 1981-2010 average on Good Friday afternoon. The reds are above average and the blues below average. 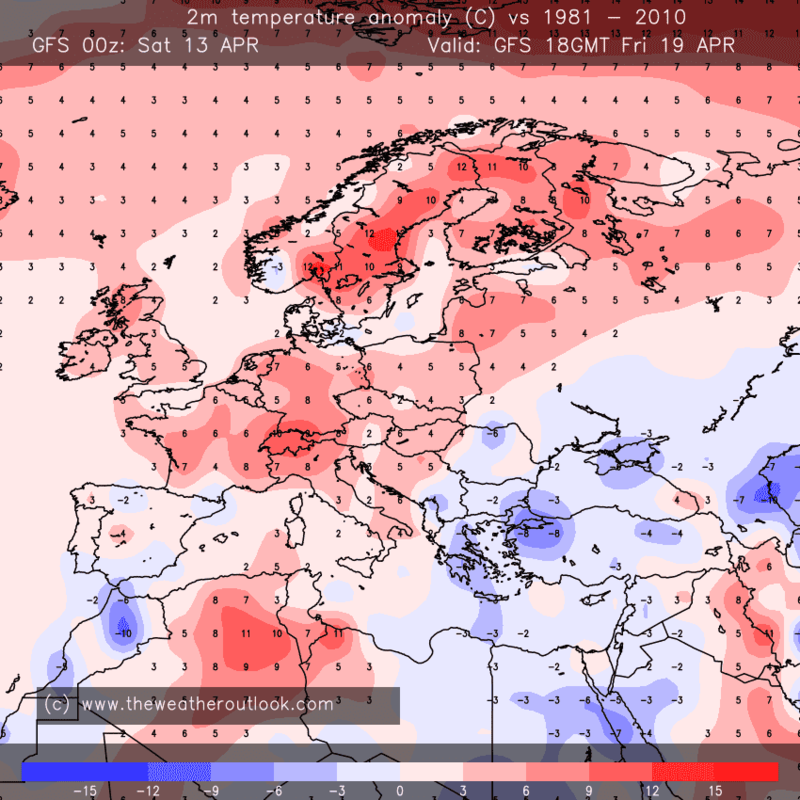 By then much of northwestern Europe is indicated as being warmer than the average. There is a positive anomaly in all of the UK with the biggest deviation in the north west. The anomaly charts are a new feature on TWO and are worth keeping an eye on. 2) By the Easter period there is a chance of low pressure developing over France. It leads to the possibility of showery conditions to the southern half of the UK. Temperatures will recover during the coming days in much of the UK and climb above the average. It could be quite warm by the Easter period. To offset the potential Easter warmth there is a risk of showery rain in the southern half of the UK as low pressure develops over France.